7 Kids and Us: Lalaloopsy Bubbly Mermaid Review and Giveaway! From the day the commercial for Lalaoopsy, my girls were hooked! I knew this was going to be a great product because Lalaloopsy is so adorable, and she is just what little girls like. 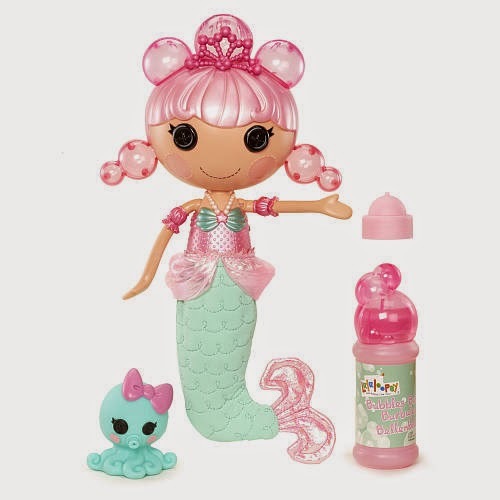 The Lalaloopsy Bubbly Mermaid is no exception! She is obviously SEW cute, and comes with her own pet octopus which can be filled with water and she "squirts" it out of her nose. So, the day that I received the Bubbly Mermaid, I decided to surprise the girls during bathtime..I brought her in while they were playing in the tub, and as soon as they saw her, they were in love! She is such a cute bath friend. You put the bubbles in, and you squeeze her belly to make her "hair" which is really bubbles...grow! The kids can make her bubble hair as long or short as they can, and then put her back in the water to wash it away, and start all over again! When you are done with the bubble solution provided you can just use shampoo or any liquid soap..I haven't had to do this yet, because the solution she comes with lasts quite a while! 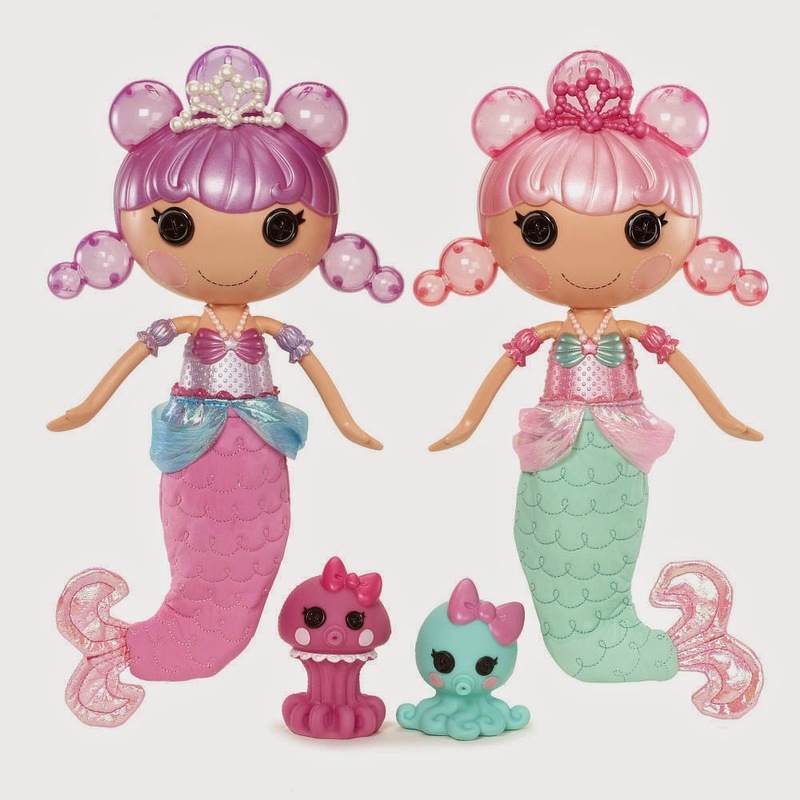 The Lalaloopsy Bubbly Mermaid dolls come in 2 styles, Pearly Seafoam and Ocean Seabreeze, I am super excited about this, because then each of my girls can have their own unique doll and pet! 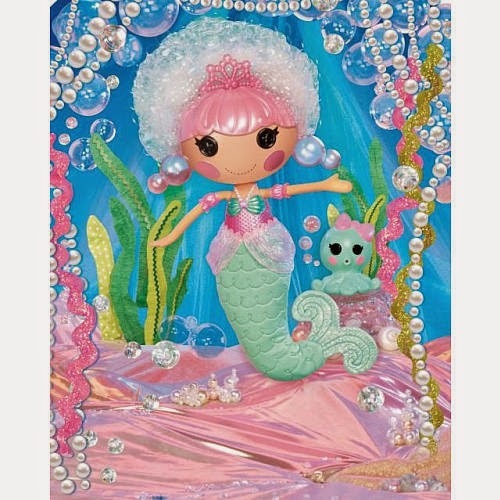 You can purchase Lalaloopsy Bubbly Mermaid Dolls at Toys R Us, Amazon, and other retailers for about $29.99. not sure but my daughter would love this!! My daughter likes Smile E. Wishes! My two daughters love anything la la loopsy. They love the dolls and watch the show. All are loved but Pepper Pots 'n Pans is a favorite due to kids loving to cook. I'm not sure which is her favorite. She watches the show a lot and has one doll that has short pink hair. My daughter doesn't have a favorite character, but she love the ponies! My daughter loves peanut big top! My daughters favorite Lalaloopsy character is Crumbs Sugar Cookie. My son loves Dot Starlight! My niece doesn't own any, but she's obsessed with pirates and mermaids! My daughter loves Mint E Stripes. Hi! I don't know what my granddaughter's favorite is but, we live in Florida, and she would love this mermaid! Thank-you! My daughter loves them all. Thanks for the giveaway. I don't know their names but my nieces love them all ! she hasn't got a favorite yet, but I know she would love this! My daughter doesn't have a fave yet,but every time we are in the store she sees them and freaks out! She would love this! My daughter loves them all , especially Smile E. Wishes! I've never watched it closely enough to know names! My daughter loves the animals. She's always asking for the dog from Lalaloopsy. My niece enjoys all the characters, not sure which is her fav!